As I just explained to Al, I don’t think there’s anything odd about going out for walks at 11pm or even later. For a start it’s nice and cool. There’s no people around to possibly annoy you, and next to no traffic. It’s quiet, and if there was anything good on telly, it’s long over. Here’s Photo Project Day 14: Somewhere in Madeley, a little before the witching hour. 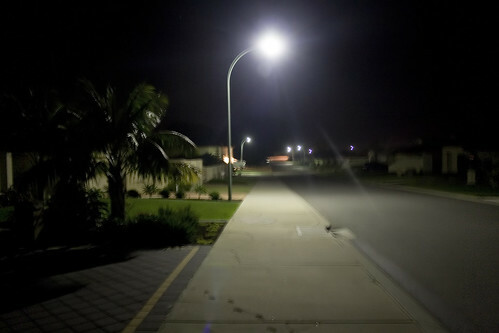 I took my camera out in the hopes of seeing something interesting or spooky but it’s a quiet suburb, there’s not much happening. I tried to take a photo of some water patterns left by someone’s sprinkler but I think they saw me out the front window cos the sprinklers went off pretty quick, they probably thought I was documenting watering-day abuse or something. Not that I have any idea what days are watering days, not having a garden requiring watering myself. Nor do I care.